ED NOTE: Other than running one of the most righteous record stores in New York, Michael Carlucci was also a close friend of Robert Quine. 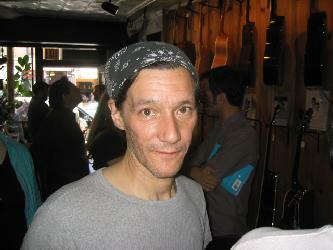 Quine and I became friends sometime around 1991/92 when I first opened Subterranean Records. Robert and I had 3 things in common: Telecasters, Jeff Beck and The Velvet Underground. While the recordings Quine made of the VU were common knowledge among VU collectors, I for some reason never bothered him about them. Most VU fans would offer him money, trades, their first born, etc. etc. Quine politely told them all no. Then around the summer of 2000, I'd heard that Moe Tucker with Lou Reed's (approval) had approached Bill Levinson (Polygram then/Universal now) with the idea of releasing VU shows as "The Bootleg Series." The tapes started pouring in, 99% of which had already been in circulation as actual bootlegs with everyone claiming they had the original masters. So now was the time to approach Quine. So Quine, Levinson and myself met for lunch to discuss the plans. Quine was overly concerned about Lou's reaction. He was sure that once Quine's name was mentioned Lou would say no way. On the contrary Lou, to Quine's surprise, didn't even have to hear the material, he told Levinson: "if Quine says they're the best versions of the songs then I'm sure they are, I trust his ears." Quine was elated. So we were ready to roll. After our meeting, Quine gave me the original 2 track reel-to-reel masters which I had someone transfer to cassette and then to CD. What was originally slated as a 2-CD set was now fast becoming a 3-CD box set as all but 3 of the tracks had never been released before: "Heroin, "White Light/White Heat" and "Rock & Roll" had all come out on the 1969 live 2-LP set. So now that all of the tracks were picked it was time to clean up and transfer the tapes. Quine and Levinson went out the Polygram's warehouse in New Jersey for this process. Quine couldn't wait to tell me when he came back that he actually held the master tapes for the VU & Nico LP. It was like touching the Holy Grail. After that was all done, Quine was asked to write the liner notes, which he did ever so eloquently. However, he was really disappointed because of a silly omission. Quine was trying to set the scene for the introduction to "Sister Ray" where each night before they would begin the song, the band would pass around a joint and if I remember correctly a bottle of Jack Daniels to elevate the mood I suppose. Much to Quine's and my surprise, Polygram thought that this was not a good idea. What!!! From a band that wrote songs about shooting dope, screwing corpses and did write a song called "Heroin", the idea of the band passing around a friendly joint in 1969 was not cool for the people to read about in the year 2001? Quine put up a minor fight, but then gave up. The rest, as they say, is history. Sadly, there was talk of Quine forking over some of the complete shows he had on cassette. Unfortunately, as interest in VU had simmered down so did Universal's interest in the remaining Quine tapes, which now will probably never see the light of day. A lot of people tried to help him. However, without trying to be rude or naming names, Quine genuinely liked about a half a dozen people. He tolerated a lot of people and barely at that, but for the most part, he just wanted to be left alone. He wasn't interested in playing out, and if anyone knew anything at all about Quine, unless it was for an incredible amount of money, he would almost always turn down a live gig. All Quine wanted was to go into a studio with parts all worked out and bang it out. He was interested in doing a gig at the Knitting Factory with Marc Ribot or Jody Harris even if it meant a decent paying gig. So no one should be offended by his turning down their offer. I can't tell you the number of suggestions I mentioned to him where he flat out refused, and he and I were good friends. I was probably as close to Quine as anyone could get. I was not offended in anyway, I understood perfectly where he was coming from. Now if Ribot had called and said I have a studio gig with so and so, they need another guitarist to sit in for this recording session, he'd be there. Alice (Sherman, Quine's wife) and I would talk about this all the time. We both complained how all of these Quine wannabees were getting all of this praise and work while the real thing was sitting on a shelf somewhere collecting dust. One of the last studio sessions he did was for Andre Williams, which he did for nearly nothing. He knew that Andre couldn't afford him, but like Lou Reed, Quine thought Andre was a genius. Quine didn't use that term loosely. As far as I know, there were 3 people he considered to be genius: Lou Reed, Andre Williams and James Burton. He also considered Burton to be a moron as a person, but when it came to the guitar, he was pure genius. Contrary to popular believe, Quine was one of the most sensitive people I ever met. Playing the way he did, how could he be anything else? After Alice passed away he would come here every day for a hug, yes a hug either from me or my wife or both of us. He needed attention just like any one of us. I'm sure that the session phone not ringing in over 2 years also led to his feeling useless in this world. I believe that more than anything else in this world he would've loved to have played with Lou Reed again. The loss of Alice as well as the loss of studio work lead to his getting deeper and deeper into his depression. I can't tell you the number of times he would sit idly waiting for someone in my shop to pull a Voidoids CD, or a Lou CD he had played on just so he could tell them he played on it. At the same time if someone approached him after recognizing him here, he would be more than happy to not only sign whatever they purchased, but talk to them at length about himself, the people he played with or about any of the guitarists that influenced him. This was how I was to learn about how much of an influence Harvey Mandell had on him.